Motorists in Alnwick may be looking forward to the end of the roadworks at the A1 roundabout, but more is to come in the next six months. In February this year, work to repair the A1 bridge to the south of the town began, leading to queues and tailbacks at the Willowburn roundabout. The contraflow on the A1 trunk road itself ended prior to the August bank holiday weekend. Additional works beneath the bridge, on the A1068, with traffic lights governing access to the A1 southbound and the Shilbottle Road are due to be completed by the end of this month. But the slip road under the bridge is set to be the subject of further works – and further disruption – as a byproduct of the new McDonald’s next to the petrol station at Cawledge, which is set to open later this month. A county council spokeswoman said: “As part of the planning permission requirements for the McDonald’s restaurant development at Willowburn in Alnwick, the county council has stated that the developers need to provide a ghost right-turn lane (third lane) on the nearby A1 slip road. This means that traffic heading to Shilbottle, the new drive-thru restaurant or the other businesses and facilities at Cawledge will have a separate lane to turn right so that traffic accessing the A1 southbound is not impeded. When the application to build the McDonald’s was approved in November last year, this condition to provide the lane required it to be implemented before the outlet could open. 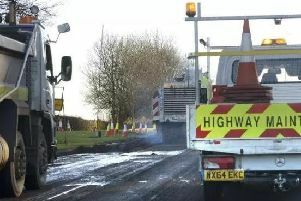 However, earlier this year, the fast-food giant applied to vary this condtion due to the works being carried out by Highways England on the bridge. This was approved in April and means that they have six months from when they start trading to complete the works. The new McDonald’s, which will create at least 80 full and part-time jobs, is scheduled to open on Wednesday, September 23. Under the new condition, this would mean the new ghost lane being completed by the same date in March 2016.